The Charlotte Bobcats hosted an NBA Draft Party last evening at Time Warner Cable Arena. By most accounts it was a fun, well-organized event. That is, until it was time for the Bobcats to make their selection with the fourth overall pick. Watch the YouTube video below of fans inside the arena, who are gathered in front of TVs, as they react to NBA Commissioner David Stern's announcement of the Bobcats' pick. The fans in the video clearly aren't happy, but let's hope the Bobcats front office made the right choice by picking Cody Zeller, the seven-foot, 240-pound center from Indiana University. The decision is being scrutinized all over media and social media, particularly because Kentucky star power forward/center Nerlens Noel was still available. Maybe the Bobcats saw something in Cody that made them think he'd be the best fit for their fledgling team (he put up good numbers in college). But it doesn't help that the Bobcats--and owner Michael Jordan--don't have a good track record with first-round draft picks (check out my 2011 Charlotte magazine article with ESPN analyst Jay Bilas, where we analyzed "A History of the Bobcats' First-round Draft Picks"). In this CBS Sports video below, a trio of sports analysts tells us more about Cody Zeller. I'd never heard of him until last night. 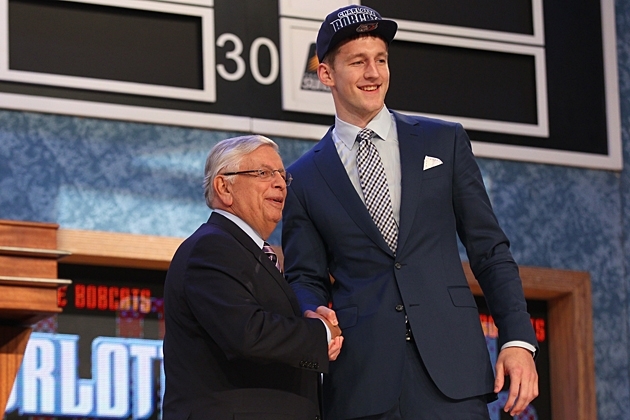 You can follow the new Bobcat on Twitter @CodyZeller and Facebook.com/codyzeller40.